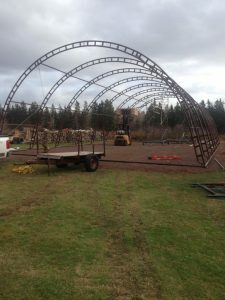 Fabric Buildings | Portable Buildings | Engineered Truss Structures > Building Uses by Industry > Fabric Buildings for Commercial Equipment Storage > Personal Storage Building – D.A. I needed extra storage and with my new FastCover I am now able to use my other building for my business. I heard about FastCover from a friend and when I called the sales person, she was very pleasant and went the extra mile to make sure everything went well for me. FastCover was the only company who asked me what I wanted instead of telling me what I wanted. My new Portable FastCover doesn’t require any type of cement footing which made it more cost effective. I installed it myself and anytime I had any questions they were just a phone call away. You will get good service here because they make you feel like a person and not just another sale. I have had my FastCover for one winter now and it stood strong in 120km. Very Impressive! The equipment storage building cover includes green trim with the majority of the main cover white to match the other buildings on the property. No artificial lighting was required in this application as the white fabric lets 80% of natural light through for great working conditions during daylight hours. A 36”x80” steel insulated pre-hung man door was installed complete with sill and brickmold for a clean installation and keyed lock. 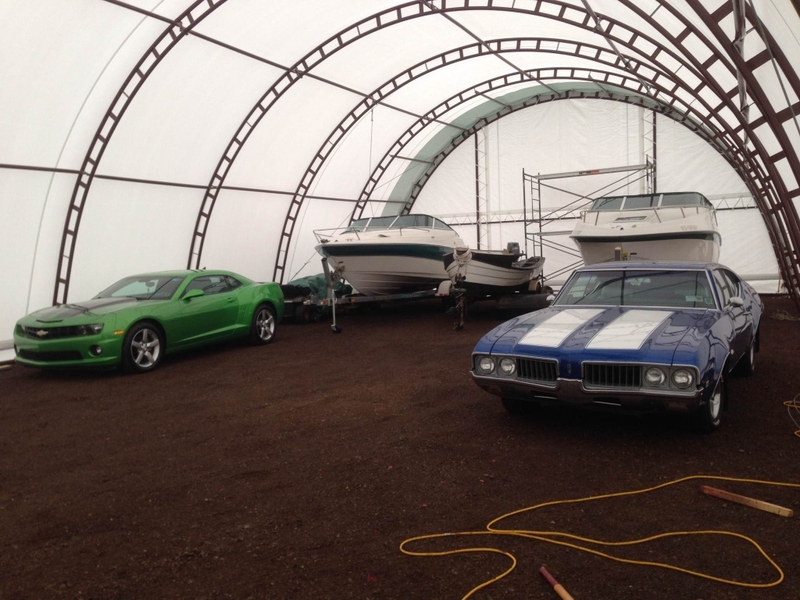 This allows the customer easy access to the interior during off season to check on his “toys”. The main overhead door is a 16’ wide x 15’ high fabric roll-up door with manual crank system. The door is secured to the baserail with ratchet straps when not in use and ball bungees secure the sides of the door to keep snow and rain out. This type of door is very cost effective especially in an application such as this one where the door is used less frequently due to the seasonality of the cars and boats stored inside. 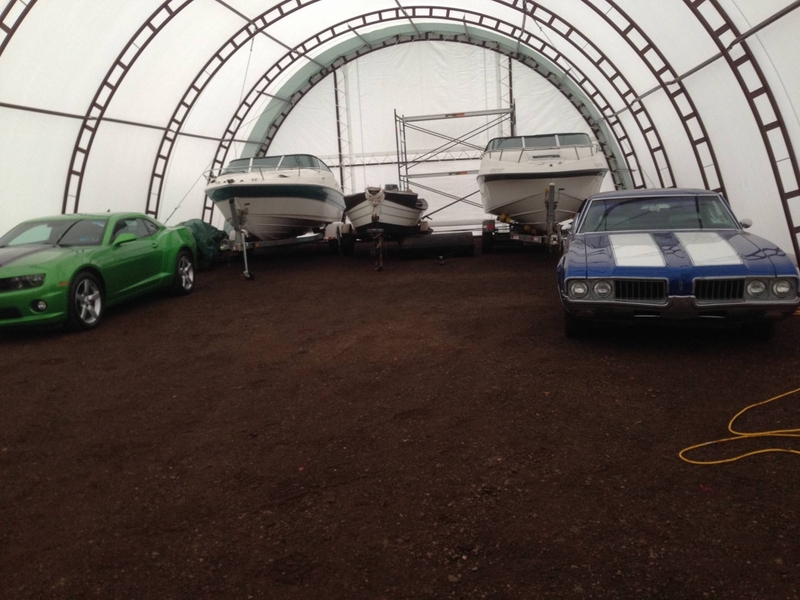 The storage building easily provides ample room for additional boats or cars with room to polish and maintain them. As you can see the customer likes to keep both new and old muscle car technology plus his boats in pristine condition, out of the elements and ready to pound the pavement or waves.